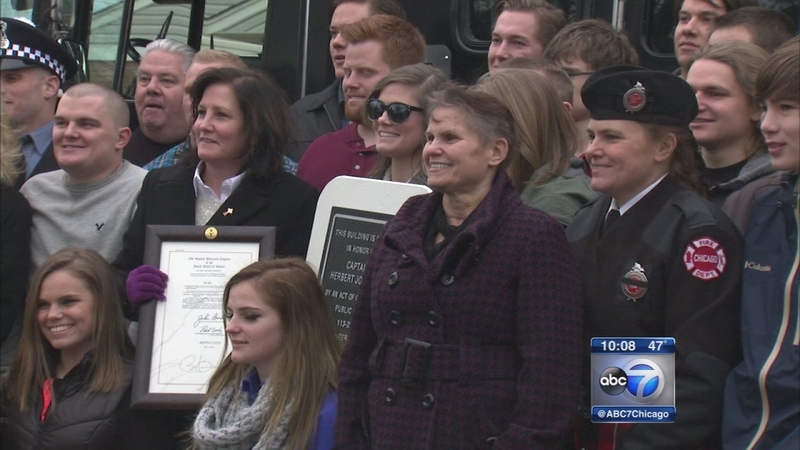 CHICAGO, Ill. (WLS) -- The Mount Greenwood post office was renamed Sunday the "Captain Herbert Johnson Memorial Post Office," in honor of a beloved fallen Chicago firefighter. It was a ceremony to rename his neighborhood post office. Herbie Johnson was an Illinois Medal of Honor winner for rescuing several children from a burning building, and was well known and well liked in the department and in his South Side community. The Mt. Greenwood post office is officially named after fallen Chicago Fire Department Captain Herbie Johnson. "I look forward to getting my mail every day from Herbie's post office," said Susan Johnson. "No bills I told him." Humor was a big part of Johnson's life and no one, including his wife, was afraid to use it Sunday for this dedication ceremony. Known for his larger than life personality and smile, the 32-year Chicago Fire Department veteran was killed while battling a blaze three years ago. Commissioner Jose Santiago had known Johnson well since 1980. "He left a good legacy and we now we are paying a little bit back to Herbie," Commissioner Santiago said. "How fitting an actual federal building names after Herbie Johnson." "A tremendous honor, nobody gets a post office named after them, especially for an ordinary guy like Herbie," Susan Johnson said. Johnson comes from a big family of fire fighters and police officers. They say the post office isn't just for Herbie, but for all first responders. "Losing him the other day is bringing back all the memories," said Herbie's brother, Ted Johnson. "Thank a fireman, paramedic or policeman for the sacrifice they make because not everyone comes home," Susan Johnson added. Susan Johnson says while so many people gave her support three years ago, she is doing the same for Dan Capuano's family. Johnson met with Capuano's wife, Julie. Johnson says the hardest part is months down the road when everything settles down and everyone goes away.